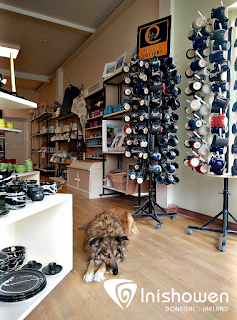 Overlooking the picturesque town of Moville, Inishowen, there is a hub of craft called Moville Pottery. Moville Pottery is owned and run by Lowry Wasson and partner Brian McLaughin. "How Could you Live in Inishowen and Not be Inspired"
Arriving at the entrance, prepare to be greeted by Lacey pictured above. 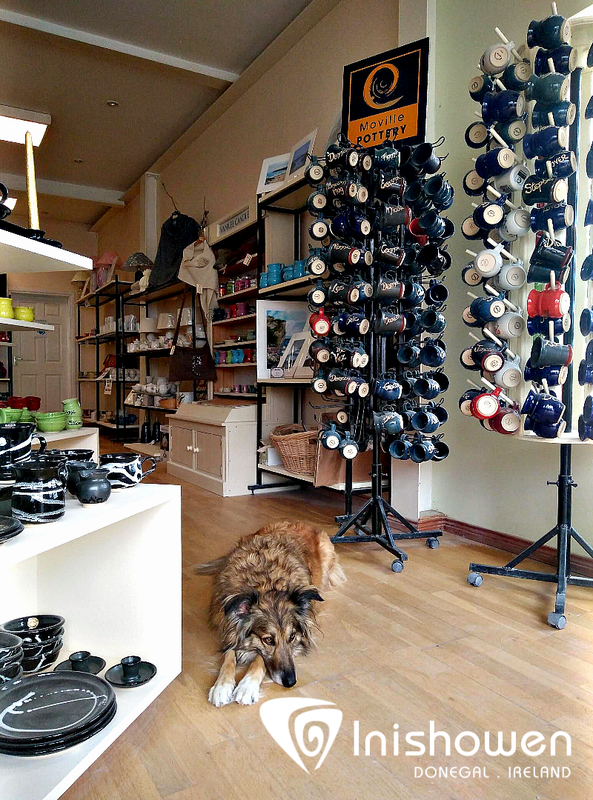 The shop itself is bright, spacious and full of coloured mugs and dinnerware of all shapes and sizes. On closer inspection you see the intricate designs and layered textures on their pottery range, that I found was chiefly "inspired by the Inishowen landscape". At every corner is an example of beautifully crafted, contemporary pieces of work, which include products from local craftspeople in Inishowen and the North West of Ireland. At Moville Pottery you will get the chance to see, what was once the worlds largest tea pot that can hold up to 23 gallons of tea!! 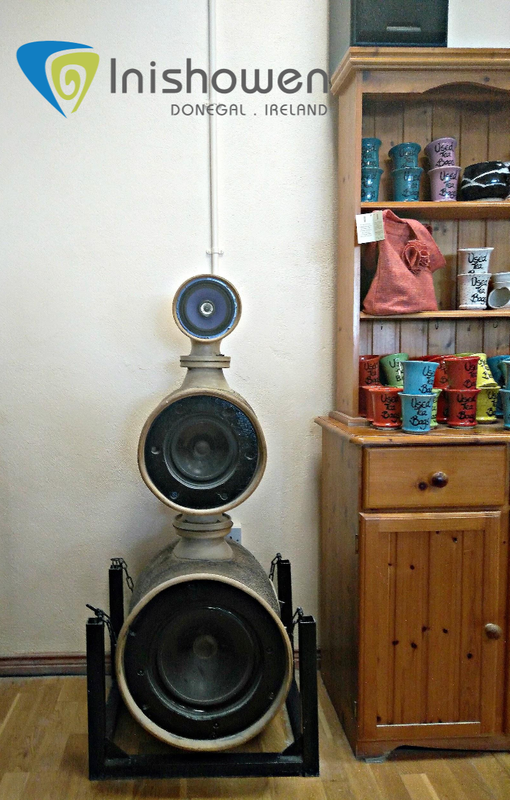 and the only example of a working ceramic speaker system in Ireland. They are fantastic examples of some of the innovation and craft that you will see at every stage of your visit from shop floor to workshop. The popular Galaxy Green range pictured below, is inspired by the colours and textures of Kinnagoe Bay, an area steeped in history and natural beauty on the Eastern side of the Inishowen Peninsula. 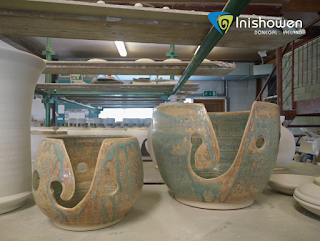 The formation and shape of the rugged rocks at Kinnagoe, and Five Fingers Strand, near Malin Head, inspire the shape and design of some of their pottery. 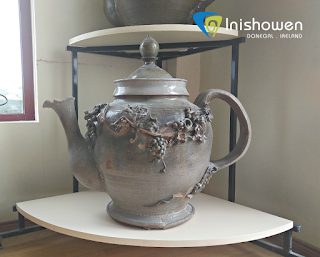 Having celebrated over forty years in business, owners Lowry and Brian, have built up an impressive range of pottery that is in high demand in Ireland and internationally. Commissions have been requested by cafes, restaurants, hair and beauty salons and other businesses throughout Inishowen, Ireland, Northern Ireland, and Spain. Both Lowry and the staff take time during your visit to answer any questions about the pottery making process, including the inspiration behind their designs. 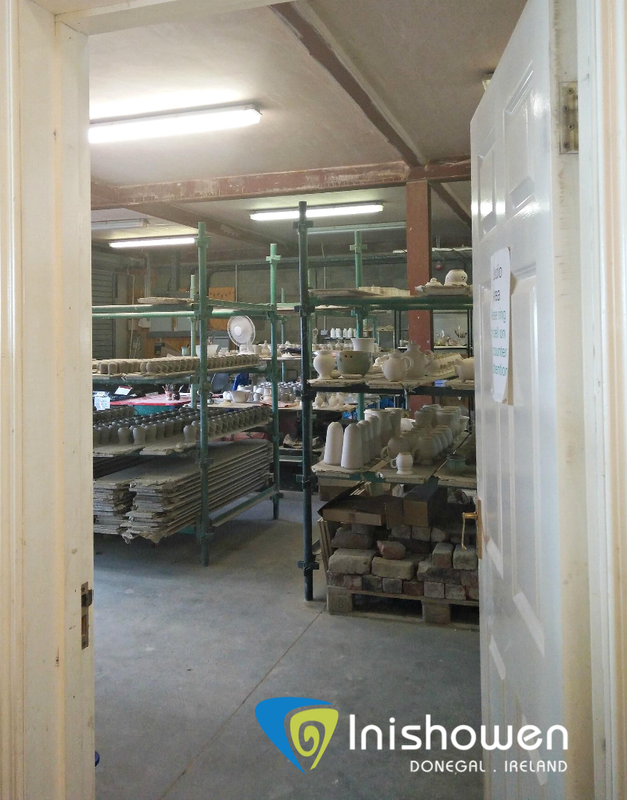 Upon invitation, you also have the opportunity to view their workshop, pictured above. Tune in next week to find out more about how Lowry and Brian make there unique pots and find out a little about some movie stars that are sipping tea out of a Moville Pottery mug!